Jari Hurri sent his stack over to table neighbor Greg King, who joined the big stacks after the dinner break. 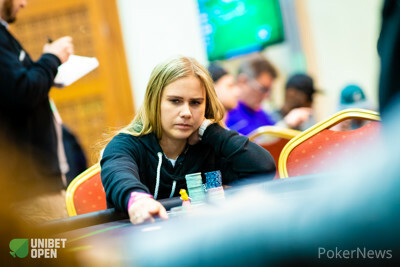 One table over, Monica Vaka also built her stack after taking from Christopher Stephens. Vaka raised to 2,200 and was called in a battle cutoff versus button. Another 3,500 each followed to the middle on the :::Jh:::8h:::3h flop and the :::Ks turn was checked. On the :::Qs river, Vaka check-raised from 10,000 to 22,000 and a visibly confused Stephens reluctantly folded.